A web host is simply a site server that has the ability to power your site and troubleshoot it whenever necessary. 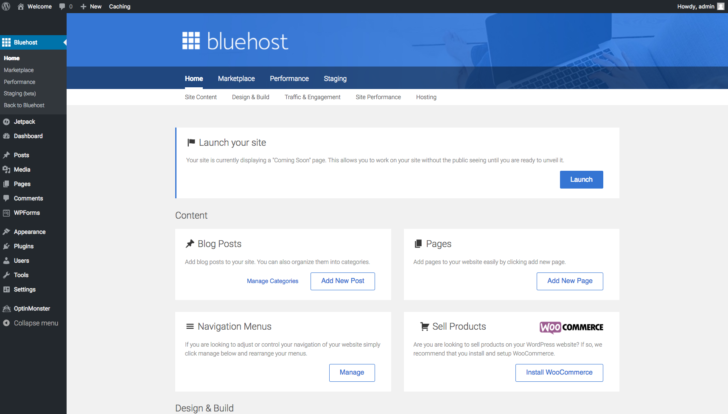 Without a web host, you cannot have a running website. There are free web hosting options out there, but if you want a more stable site with higher up times and faster load speeds, it’s best to pay for a reliable web host company. I’ve currently got a dedicated server with a dedicated person monitoring my site that costs ~$200/month. But I’ve also been blogging for over seven years and have over 1M pageviews a month. Start small, and work your way up. Choose a shorter domain name because it is generally easier to spell and get right than a longer domain name e.g. Jet.com vs. SellingArtsandCraftsForLife.com. Choose a domain name that ends in .com for more credibility, followed by .org and .net. 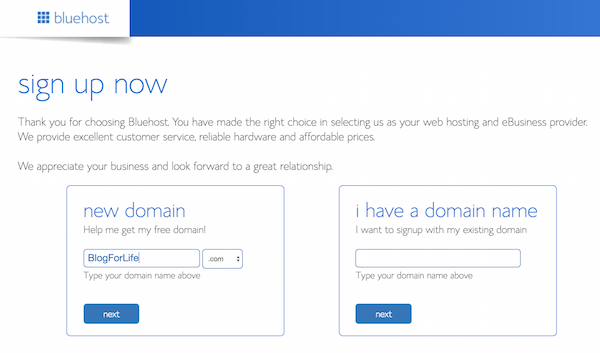 I spent about one hour brainstorming a list of possible domain names and then went on Bluehost to see what was available. 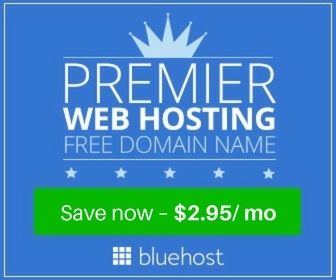 Once you get on the site, click the basic hosting plan for only $2.95/month to get you to the next page where you can input your New FREE Domain name when you sign up with Bluehost. Start punching away to see what’s available! 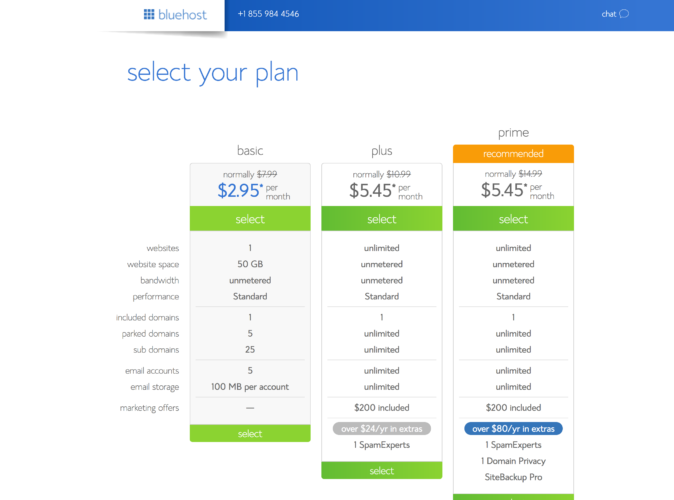 If your domain name is not available, Bluehost will give you a whole bunch of suggestions as to what’s available. After you’ve selected the basic package and found a free domain name that works, you’ll come across this portion of the sign up page with a whole bunch of different options. If you don’t want anybody knowing who owns your site, click Domain Privacy Protection. 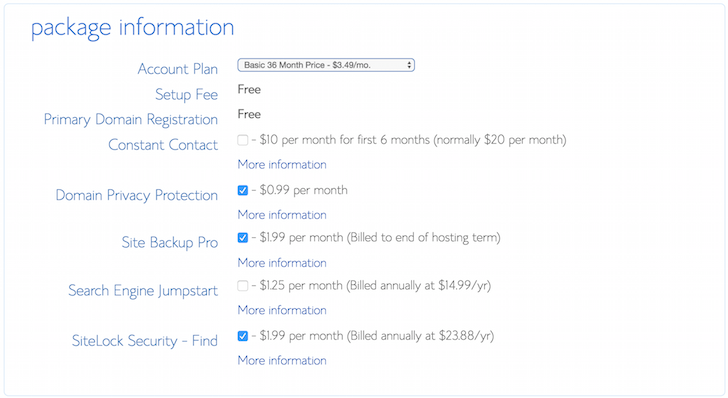 The Site Backup Pro for $1.99 a month may be a good idea because you never want to lose your work. But once you get your site up and running, there are free WordPress.org plug-ins that will backup your data for free. I wouldn’t choose and pay for any of the other options. Congratulations! You now own your very own website! 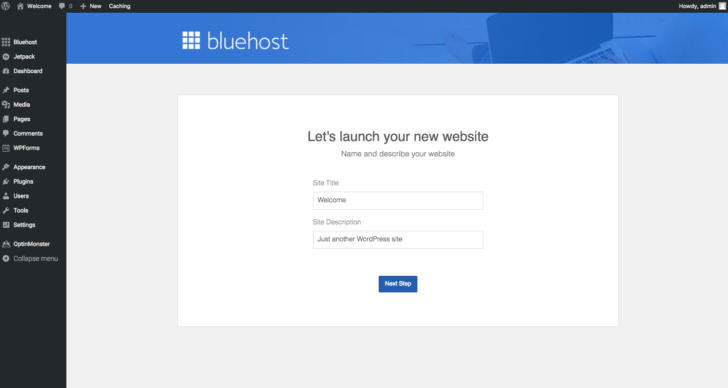 For 2018, Bluehost has allowed new users to sign up directly through their platform! WordPress is by far the most popular publishing platform on the web. WordPress is easy to set up, easy to use, and extremely customizable with endless amounts of free widgets and themes to choose from. 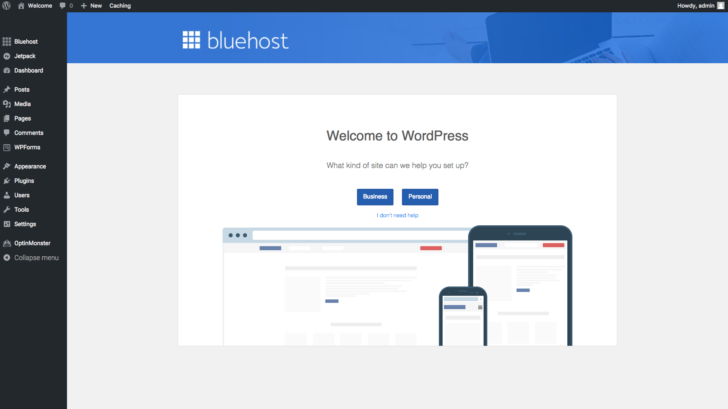 This experience allows customers to sign-up for Bluehost with a one-click automatic WordPress install at sign-up. You no longer have to manually install WordPress. See the below screenshots to see how easy it is to install. FinancialSamurai.com is on WordPress, and has been since 2009. The Genesis Theme is one of the most beloved WordPress themes out there. Genesis is what Financial Samurai uses. For a one time fee of $59.95 through StudioPress, Genesis will provide you a simple, sleek layout that is fully customizable. The theme is also Search Engine Optimization friendly and loads faster than other designs due to its framework. Load speed and design are critical for all websites. Studies show that if a webpage doesn’t load within three seconds, the majority of users will click elsewhere. If you don’t want to pay money for a Genesis Theme, you can always go generic. 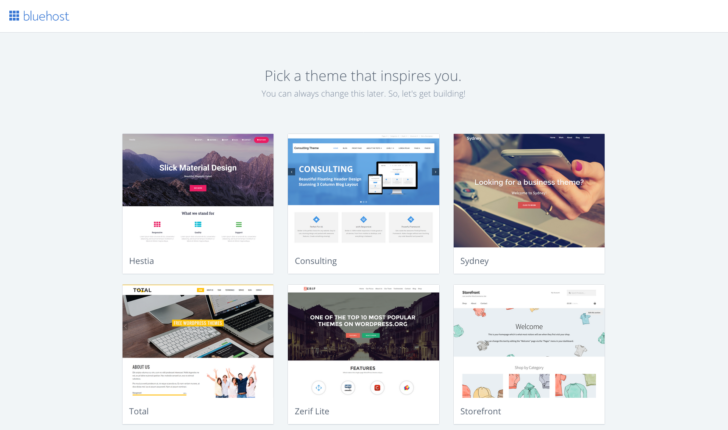 There are hundreds and hundreds of great free themes to choose from. I used one for a year until I kept coming across other websites that used my same theme. I wanted to be unique, so I finally went with Genesis. The great thing about Genesis is that it is well followed by thousands of independent web designers. So if you ever want to get someone to customize your beautiful site, you’ve got plenty of people who can do it for you. 1) Comment on larger blogs in your niche. If you leave a well-thought-out comment on a popular article, you will most likely have some readers trickle your way. It might just be one or two from each comment, but if you comment in many well-known places you will notice your readership increase quite impressively. Each comment will leave a link-back to your site and links are the currency of the web. 2) Write great content where you have an edge. It’s better to write from experience because there are too many pontificators out there who clearly don’t know what they are talking about. For example, if you are not retired, then writing about retirement life won’t be credible. Always think about what makes your content unique, entertaining, and value-added. 3) Guest post on larger blogs. Guest posting on larger blogs in your niche is one of the best ways to supercharge your traffic and create an audience. 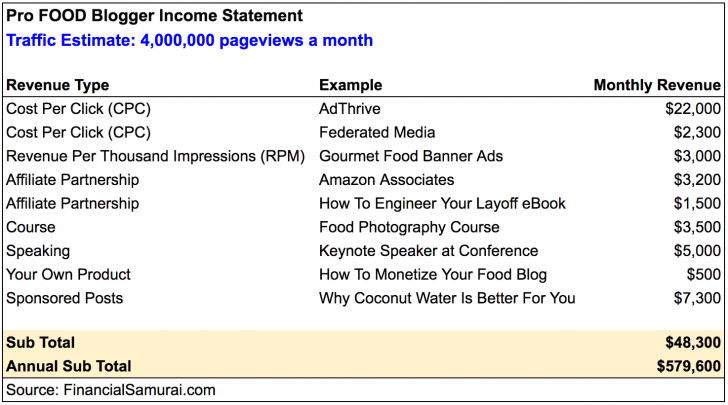 Before guest posting, try and get to know the blogger for 3-6 months. Comment on his site and share his posts over your social media network. He will take notice of your tireless support. Now it’s time to reach out over e-mail and ask if you can create a custom guest post that jives off a topic he’s already written about or write something brand new. Have at least one link back to your site. 4) Build a community. Remember that your community is always first. The biggest blogs in the world have built great followings because they share personal stories and opinions on things they care about. Once you have a community of raving fans, they will become your greatest supporters. Before publishing any post, ask yourself whether the post is something your community wants to read. 5) Have a consistent writing schedule. Financial Samurai usually publishes on Monday, Wednesday, Friday and sometimes on the weekend. I stuck with this three-posts-a-week schedule without fail for five years and readers have come to appreciate the consistency. It’s important you create a regular publishing schedule in order to build appreciation, loyalty, and trust with your ever growing reader base. The sky really is the limit regarding how much you can make online. Getting rich is all about having leverage. You’ve got maximum leverage once you start your site since there is no limit to how many people can visit your site 24-7, unlike a retail store.